One of the reasons we picked Powell River for our home was because of its strong sense of community. One example is the annual Sea Fair. From Friday through Sunday, Powell Riverites enjoyed good food, music, booths and entertainment. It's amazing how much local talent there is here in Powell River. As far as the music went, our favourite was Len Menard with his Johnny Cash impersonation. He's really great. For food, it ranged from sushi to curry to prawn kabobs to gyros to traditional hot dogs. It's hard to pick a favourite from that international smorgasbord. Entertainment included a carnival with lots of rides, games and prizes, but of course my favourites were the parade (including the ATV Club) and the Saturday night fireworks. Wayne and I took our bookmobile called Mr. 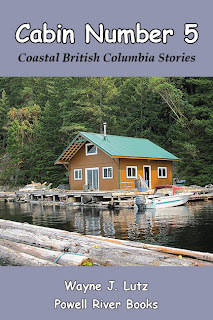 Float Cabin and sold our Coastal BC Stories books all three days. In addition to sales, we were able to listen to the bands and singers, and met lots of friends, neighbors and new acquaintances. Our small bottle of 10,000 year-old Powell Lake sea water was a hit with young and old alike. 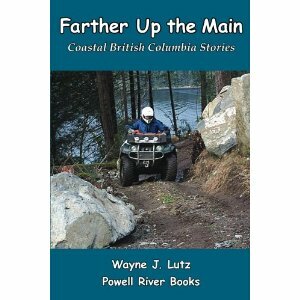 Book Launch for "Farther Up the Lake"
Wayne has just completed a new book in his Coastal BC Stories series. It follows in the steps of his first and most successful book, Up the Lake. Naturally, it is entitled Farther Up the Lake and focuses on our favourite place on earth, Powell Lake. In it you will read stories about the people and places that make this region so unique. 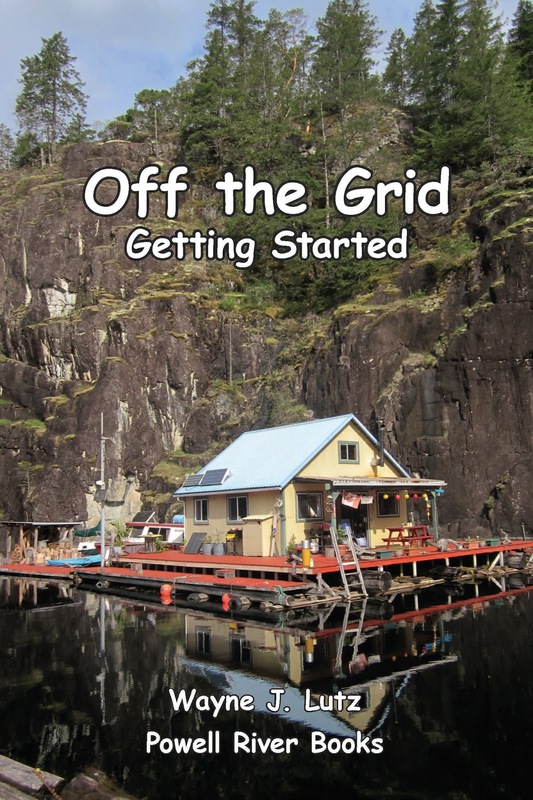 And of course, there are chapters about what it is like living off the grid in a float cabin. Come join us at a free book launch event. This weekend Wayne and I went to the Powell River ATV Club's annual campout and poker ride at Kent's Beach near Saltery Bay. Kent's Beach is an excellent location for an event like this. They have a large group campsite and many other nearby sites for overflow crowds, some with full RV hook-ups. For those who want a little more luxury, there are even oceanfront cabins for rent. Our club's president Dave and his wife Marg really organized a wonderful weekend. For several weeks in advance, the Wednesday trail building group worked on reopening and grooming the path we would take. Winter storms down trees and spring brings new alders that need to be removed. We really thank them for all the hard work. On Saturday morning, 40 quads took off for a day of fun in the bush. Since the weather has been warm and dry, some sections were pretty dusty, but the majority of the ride was on shaded hard-packed trails. You can see where we went in yellow on the map below. 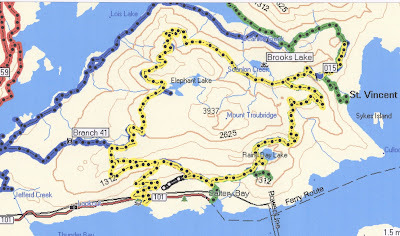 The whole group stopped at several panoramic viewpoints of inland lakes and coastal islands. At three of these, we drew cards for our poker hands. When we arrived back at camp there were prizes for the top three hands and enough door prizes for everyone who attended. Wayne got a new helmet donated by Danny at Quality Parts and I got several A&W gift certificates. The support from Powell River businesses was excellent. What better for a Sky Watch Friday than looking at airplanes. Last Sunday Wayne and I went to the Texada Island (Gillies Bay) Airport Fly-in. It was a great day for general aviation. About fifty aircraft participated and hundreds of locals came out to see the action. The day was kicked off with a scrumptious pancake breakfast. Then everyone had the opportunity to check out the numerous aircraft on display. In the afternoon, the Fraser Blues Demonstration Team flew their classic North American Aviation Navions. Their show was the highlight of the day for pilots and attendees alike. The following is a short video about this unique Canadian civilian flight team. On Powell Lake in Coastal BC, heavy winter rains are often followed by radiation fog. On those days, we are fogged in at our cabin. But then, it's the place we love to be so I guess that isn't so bad. Sometimes we stick our nose out of Hole in the Wall to see what the rest of the lake is like. Because there are tugs pulling log booms and work boats running on radar, we aren't comfortable heading into the fog. Last winter I saw my first fog bow. I never knew they existed. That's what makes living on the lake so wonderful. Nature is all around and we discover something new every day. I like to work on crafts while I'm at the cabin. I just finished a latch hook rug using yarn. It's hard to find pre-cut rug yarn, but it is available online from Herrschners for Canadian and US customers. You can sometimes find canvas and latch hooks in craft stores. There are kits available, but I like to create a design of my own. My most recent rug was of my favourite place on earth, my cabin. Here's how I made my latch hook yarn rug. I cut the canvas mesh to size with a little extra for a hem. Mesh comes in two sizes, 3.75 and 5 holes per inch. I use the 3.75. At four rows per inch, each yarn package will cover a section of about three by five inches. Be sure to order enough yarn because it comes in die lots. Each package contains 320 strands of machine-washable acrylic yarn that is pre-cut to 6cm (2-1/2") long. Using a black permanent marker, I drew my design on the canvas. Don't worry, it doesn't show through. I like to work my designs by section. That way I can see how it is developing. Within a section, for example the trees, I count squares to create the detail. That's easier than drawing the detail on the canvas mesh. As the design grew, I did go back and make some changes. For example, I didn't like the way the water looked, so I took it out and reworked it with a different colour. I trimmed the edges of the canvas to one inch, turned it back and hand stitched one-inch binding tape over the edges. A float cabin is only as good as it's float. There were many reasons why we decided to buy our cabin, but one of the main factors was the excellent condition of the float structure. The foundation logs were floating high in the water and everything was well balanced. But over time two things happen. The cedar logs that make up the float structure become waterlogged. It happens slowly, but surely. Second, as more things are added to the cabin, more weight is added to the float. Those little touches that make our cabin homey also make it heavy. So, this summer we added twenty 55-gallon plastic barrels filled with air to help give our float an added lift. Some cabin owners use 275-gallon square plastic totes, but we like the barrels because they snug up nicely in the small notches between the logs. They can also be placed in strategic locations where heavy objects are located such as our wood storage shelf, stove, refrigerator and bathtub (yes, we have one of those and the proverbial kitchen sink). Last weekend for Canada Day, Wayne and I met our good friends Sam and Ken from Gibsons at Gorge Harbour for an overnight boat trip. We were shocked at how few boaters there were at the popular marina. It seemed more like September than a busy July holiday weekend. We hope this isn't a sign of things to come for our local marine resorts. After a leisurely dinner at the Floathouse Restaurant, we sat on the dock to enjoy the sunset and cool evening air. We met some of the other boaters, including another Powell Riverite who owns a local logging company. The next morning, Sam made us toast and coffee in her galley before we headed off to check out some of the other marinas on Cortes Island. At Manson's Landing we found quite a few boats at the government dock and anchored nearby. There was also a Cessna Caravan floatplane taxiing out for departure. Take a look for yourself. Want more information about unique flying destinations in British Columbia and across Canada? 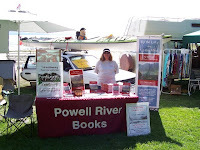 Go to www.PowellRiverBooks.com and take a look inside Up the Airway. 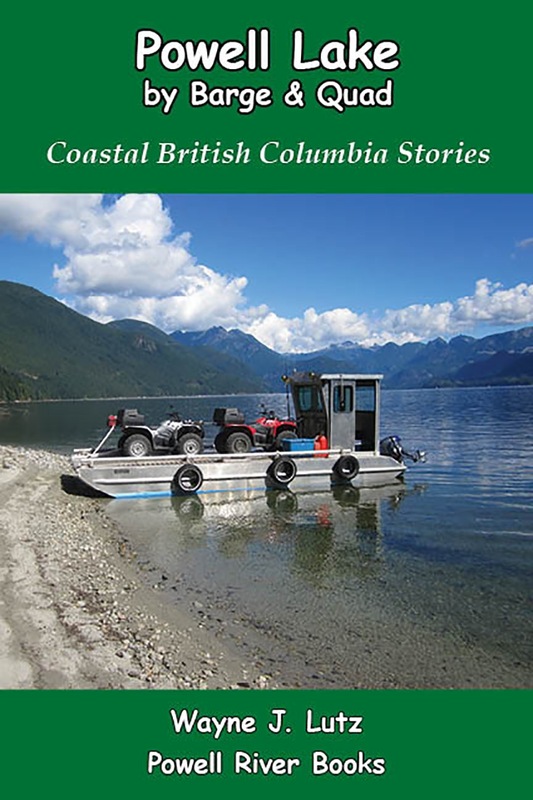 It is the newest book in the Coastal BC Stories series written by my husband, Wayne. 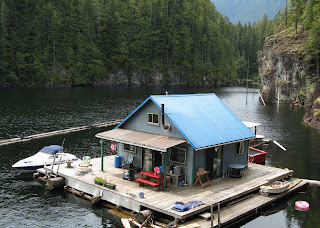 We live in a cabin that floats on Powell Lake in Coastal BC. Our lake was created by glacial action over 10,000 years ago. There's even ancient sea water trapped at the bottom. But I guess I better get to the "point" of this story. Around 1900 there was lots of logging around the lake. Shortly thereafter, a dam was built for the town's paper mill and the lake level rose, covering shoreline trees and stumps. Today, when the water level is low, you can see the remnants of those stumps with their pointed roots. To me they look like creatures from another world out for a walk.